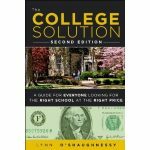 Before my son Ben left to start his sophomore year at Beloit College, we talked about the advice in a chapter of The Thinking Student’s Guide to College: 75 Tips for Getting a Better Education. I’ve mentioned before how much I love this book and I think every college-bound student should read it. Andrew Roberts, an assistant professor of political science at Northwestern University, wrote this valuable book that can help students squeeze far more value out of their college years than any other titles that I’ve seen. I thought Ben would benefit the most from reading the book’s section on choosing classes. I’m not going to lie — Ben reluctantly read the chapter. Because Ben is a math major, he knew long ago that he’d be taking Real Analysis with his favorite math professor at Beloit College in the fall and an art class since art is another one of his passions. And with a minor in physics, he’ll take a course in that subject, but that still leaves him with extra slots. (Note: During the second semester of Ben’s sophomore year he decided to double major in studio art and mathematics). Here is what Roberts suggests that Ben and other college students do to fill their dance cards: visit five to 10 extra classes during the first week of the semester. Sampling classes can provide an early impression about which professors are topnotch and which are busts. His reasoning is sound. Why end up in classes with professors who are just okay when there are always lots of excellent teachers scattered across a campus? I’m going to insert my own tip here: Try to find out who the teachers of the year are at your school. Ben’s math professor happened to be the college’s teacher of the year twice so no wonder Ben loves this guy. High school students are not familiar with most subjects that colleges offer. That’s a great reason why underclassmen, in particular, should sample as many different disciplines as possible. By dabbling, they are more likely to discover a discipline that they like. Some of Ben’s favorite courses at Beloit, including a philosophy class he particularly loved, have had nothing to do with his majors. 2. Don’t rush to complete general-ed requirements. Most universities have students complete faculty evaluations at the end of each semester. If the results are made public—and they often are—pour through them. Students tend to agree with each other on what classes are best, and these also seem to be correlated to performance. Students perform better in classes that they rate highly. Leave your comfort zone and become acquainted with world views that don’t sync with yours. If you’re a conservative, consider taking a class on Marxism or perhaps women’s studies. If you’re an atheist, try a theology course. A liberal could choose a class on conservative political thought. Even if you ultimately hate the course, Roberts suggests that you should learn more than if you had simply chosen a class that confirms your beliefs. Choosing classes that requires copious writing sounds grueling, but Roberts offers pragmatic reasons for volunteering for this torture. Employers want graduates who can write, and you’re not going to get a pass even if you’re majoring in a technical or scientific field. You will also receive more attention from a professor in a writing-intensive class since he/she must review what you write. What Colleges Have Your Major?